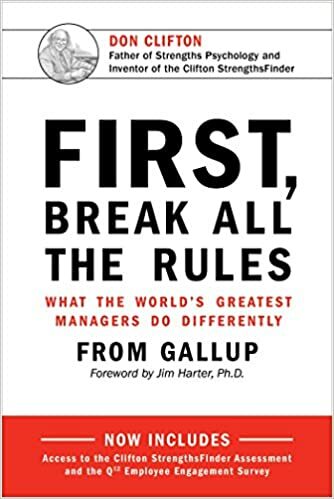 Gallup presents the remarkable findings of its revolutionary study of more than 80,000 managers in First, Break All the Rules, revealing what the world’s greatest managers do differently. With vital performance and career lessons and ideas for how to apply them, it is a must-read for managers at every level. Included with this re-release of First, Break All the Rules: updated meta-analytic research and access to the Clifton StrengthsFinder assessment, which reveals people’s top themes of talent, and to Gallup’s Q12 employee engagement survey, the most effective measure of employee engagement and its impact on business outcomes. What separates the greatest managers from all the rest? They actually have vastly different styles and backgrounds. Yet despite their differences, great managers share one common trait: They don’t hesitate to break virtually every rule held sacred by conventional wisdom. They don’t believe that, with enough training, a person can achieve anything he sets his mind to. They don’t try to help people overcome their weaknesses. And, yes, they even play favorites. In this longtime management bestseller, Gallup presents the remarkable findings of its massive in-depth study of great managers. Some were in leadership positions. Others were front-line supervisors. Some were in Fortune 500 companies; others were key players in small, entrepreneurial firms. Whatever their circumstances, the managers who ultimately became the focus of Gallup’s research were those who excelled at turning each individual employee’s talent into high performance. Gallup has found that the front-line manager is the key to attracting and retaining talented employees. This book explains how the best managers select an employee for talent rather than for skills or experience, set expectations, build on each person’s unique strengths rather than trying to fix his or her weaknesses, and get the best performance out of their teams. And perhaps most important, Gallup’s research produced the 12 simple statements that distinguish the strongest departments of a company from all the rest. First, Break All the Rules is the first book to present this essential measuring stick and to prove the link between employee opinions and productivity, profit, customer satisfaction and the rate of turnover. First, Break All the Rules presents vital performance and career lessons for managers at every level — and best of all, shows you how to apply them to your own situation. First, Break All the Rules is an extremely valuable resource for managers. This book was eye-opening for me when it comes to the word "talent," which seems to be a buzz word these days. More and more companies are saying they don't care about education or experience because they hire for talent. But what does that really mean? Gallup breaks down the different types of talent: striving, thinking and relating, and includes an Appendix with lists and descriptions of the most common talents under each of these areas. The writers help managers understand the importance of identifying which talents are necessary for their roles and how selecting for those specific talents leads to the success of the employee as well as the company. First, Break All the Rules is a must-read for managers. I highly recommend it.